Many people have their heart set on walking up the aisle to the sound of a top quality wedding string quartet, but in reality, the price of a string quartet can mean couples end up compromising on the quality of the group they book to keep within budget.¬† Unless you’ve got a large gathering planned, there are certainly smaller combinations of musicians (such as a wedding string duo) which can be just as effective, without having to compromise on their all important quality of playing. 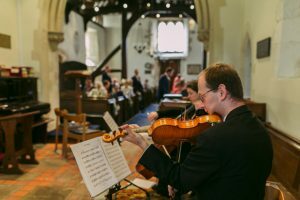 So how many players do you need?¬† If you’ve got a smaller wedding planned (with say, under 100 guests), you may not actually need a full string quartet of four players. A good string duo may have a similar impact and many people choose this option so that the music is less overpowering and to keep within budget.¬† In weighing up the pros and cons of booking a cheap string quartet (usually made up of music students, amateur or semi-professional players), opting for a string duo can be a good way of keeping within a budget without having to compromise on the quality and standard¬†of musicianship.¬† In terms of volume, if both players in a duo are highly accomplished musicians with developed skills of projection, this can often sound stronger and clearer than a less experienced string quartet anyway – despite there being only two of them. A duo takes up less space and can move between different rooms very easily, so it’s the ideal choice for registry offices or wedding venues where space is limited, or if you expect proceedings to move through different rooms in the venue as the day goes on. In our group, we had a good hard look at what repertoire was available for string duo and despite finding many breathtakingly beautiful chamber works, found that we had to carefully arrange hundreds of popular wedding songs specifically to sound full for two instruments, including modern pop music for string quartet and duo. We use lots of ‘double stopping’ (playing notes simultaneously on more than one string at once) and careful use of harmony to make the pieces sound as full as possible with just two players. We offer almost all of our duo music for either combination – violin with viola, or violin with cello – but not for two violins, and pieces on the playlist page with a symbol after them have all been carefully arranged for duo as well as quartet. The location of your musicians can make all the difference, so do consider exactly where you’re going to position them on the day itself. Professional players are all experienced at projecting their music outwards – after all, the sound of a string quartet can fill a concert hall or auditorium. Despite this, when they’re playing background music – the sound of guests talking, eating and enjoying themselves, a carpeted area and lots of people in one room can all diminish the sound. If the wedding venue have a musicians gallery this can offer the perfect solution as the sound will just drift out over peoples heads, but even a slightly raised platform or stage can work wonders acoustically. If there’s no platform available, don’t worry – leaving plenty of space around the musicians will also help. We’ve had a couple of disappointing situations where we’ve turned up on the day to find that the venue weren’t prepared for us and hadn’t left enough space for the string quartet to be in the ceremony or reception rooms. On both occasions the bride and groom had spent months putting together programmes of music to include their favourite pieces; we’d spent a long time with them on the phone deciding on music for the ceremony and had even arranged a special request to be played¬†as they cut the cake¬†- so we were all a little perturbed when we realised the venue staff¬†had literally left no room for us. After spending some time trying to re-arrange furniture we had to admit defeat,¬†so¬†played as strongly as we could outside in a corridor, but although the tables nearest the door could hear us we mainly entertained guests who were walking past on their way to the toilets!¬† Asking the venue staff to prepare four chairs, ready in a prominent area can really save time – you are paying for your string quartet to provide music, not spend valuable time looking for chairs and somewhere to play.¬† I suppose the moral of all this is when you’re paying good money for a good quality wedding string quartet, you want to make sure you and your guests can hear them and enjoy the music. A nice, elevated position will keep the quartet out of the way of waiters carrying trays of drinks, and the music can be heard easily all across the room. In tomorrow’s blog, I’ll continue to write about timings and planning for the day and a few things to remember when planning for an outdoor event.